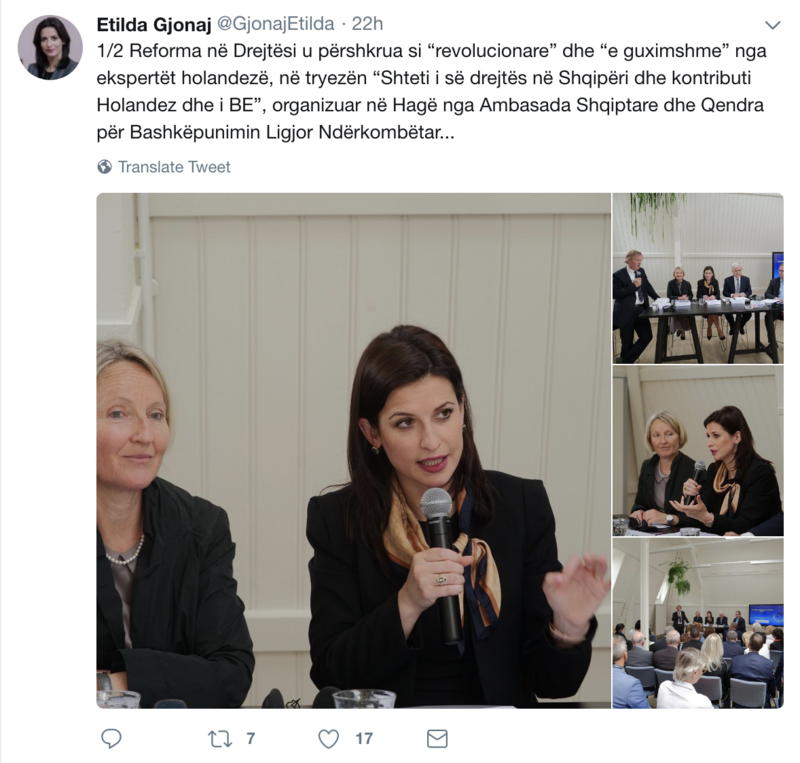 In the aftermath of the debate on “Rule of Law Reform in Albania and the Dutch/EU Contribution,” several Albanian media aligned with the ruling powers have taken it upon themselves to present the event as a success story for the Albanian government. Almost every article of the Albanian legal system has been changed. We appreciated the approval in principle of the Eurojust agreement from Albania. Through its attendance in other international platforms, Albania has turned into a member with full rights in the global legal ecosystem. Opening Albania’s accession negotiations with the EU would help encourage the government to carry on even more radical reforms. 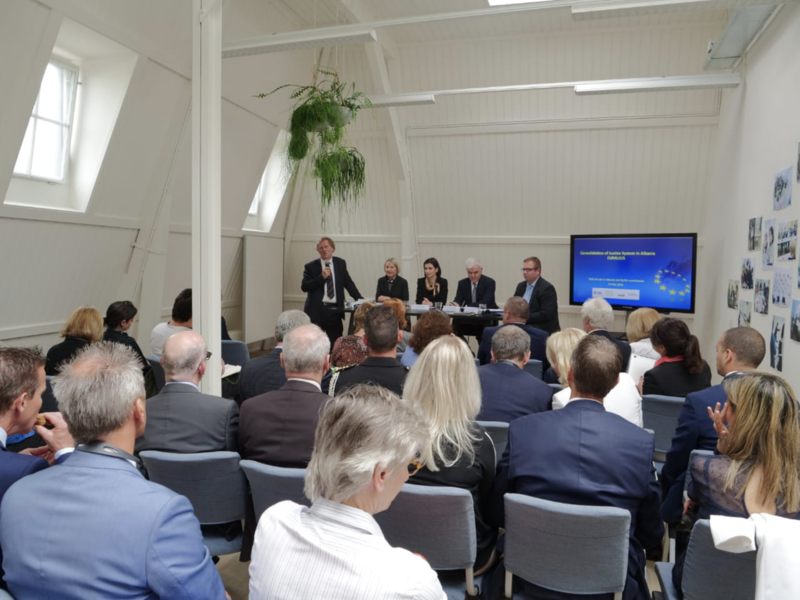 The Justice Reform was described as “revolutionary” and “courageous” by Dutch experts at the roundtable “Rule of Law Reform in Albania and the Dutch/EU Contribution,” organized in The Hague by the Albanian Embassy and the Center for International Legal Cooperation. We ought to note here that none of the Dutch “experts” involved were actually independent experts. All of them were part of the CILC, which is a partner organization in the EU-funded EURALIUS mission. In other words, when these so-called experts were praising the “revolutionary” and “courageous” Justice Reform they were in fact praising themselves and their own work. So this is how it works: the CILC and the Albanian Embassy invite the Albanian Minister of Justice and Minister of Interior Affairs to a “debate” in The Hague. The CILC then praises the Justice Reform, for which it was paid by the EU, and the Albanian government then uses that praise to argue for the opening of the negotiations with the EU: everyone wins! Thanks for your message. But please do not blame me if I do not respond extensively to your journalistic reporting of yesterday’s seminar. In my view, it lacks any form of nuance and you pull things out of context. Moreover you offer wild interpretations and accuse us of organizing an agitprop meeting. Whom the cap fits, let him wear it, I would say. I was slightly taken aback by this response of someone so deeply involved in the “revolutionary” Albanian Justice Reform. What did I “pull out of context”? My whole attempt was to place things in context: the local Albanian political and legislative context, which appears to me to be of the utmost relevance. I also would have offered “wild interpretations.” I fail to see where I did so. The last time I checked I tried to substantiate all my claims by statements and actions of Albanian government officials and other functionaries, all of which have been reported in the Albanian media. The final claim, that I would “accuse” the CILC of “organizing an agitprop meeting” is perhaps the most surprising. I tried to refrain from using the word propaganda in my reporting of the event, even though the statements of former OSCE Ambassador and moderator Robert Bosch could certainly be qualified as such (I’d gladly publish the recordings). But Vincken’s hallucination that I would accuse him of “agitprop” and that in fact I would be the propagandist in this story did give me another insight.